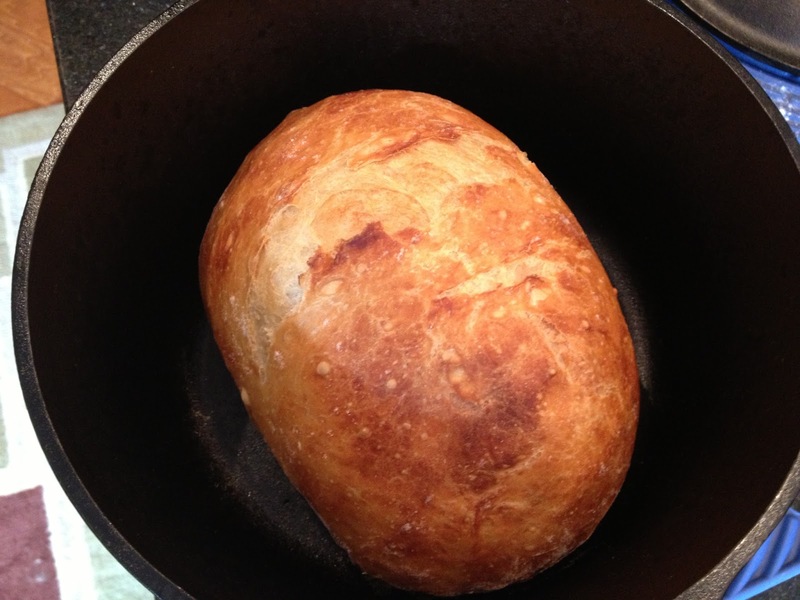 Cats On The Homestead: Dutch Oven Bread - Only Four Ingredients! 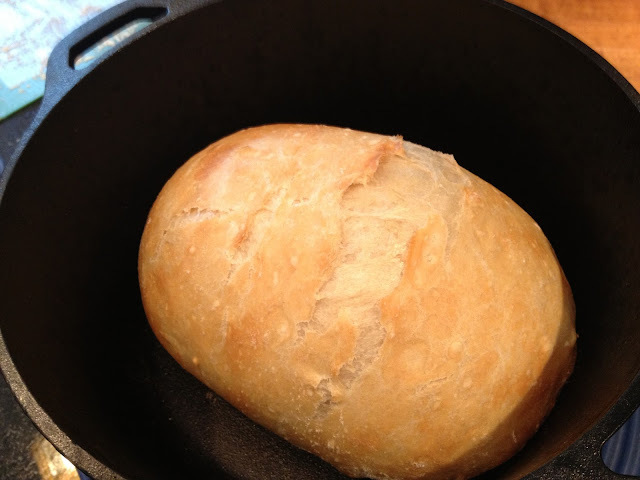 Dutch Oven Bread - So Simple! I must admit that the first time I came upon this recipe I was skeptical. Over the years I have learned to read through a recipe and get a feel for whether or not it is worth a try; meaning can I pull it off successfully and will my family eat it? So when I found this recipe a couple of years ago I was dubious. 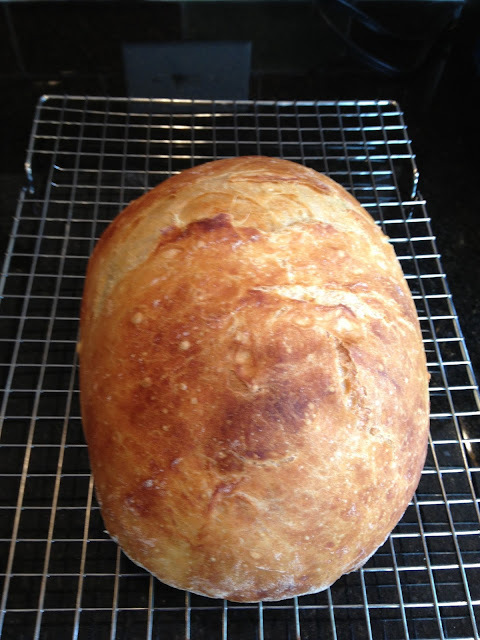 I have been baking my own bread (admittedly sporadically) for several years now and, though I know I still have lots to learn, I felt I had a pretty good handle on the basics of bread making. And this recipe did not look like it had a chance to work. But after stumbling upon it a few more times in various places I decided to throw caution to the wind and give it a try. It worked. Beautifully. It actually worked beautifully the first time. And then I tried it again and it worked beautifully the second time too. And the third. And so on. This bread is crusty on the outside and chewy on the inside. It makes a good serve-with-dinner bread or an even better serve-with-soup or stew bread. A big spoon. One of those spoon-ulas (half spoon, half rubber bowl scraper spatula thingees) works best. 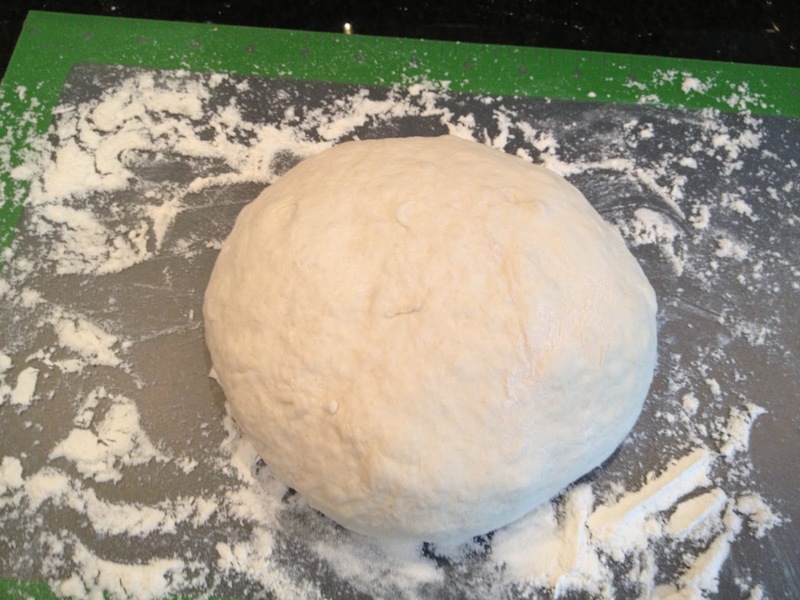 The next day after the dough has risen put the Dutch Oven into a cold oven and heat oven to 450 degrees. After the oven is preheated, set the timer for 30 minutes and leave the Dutch Oven in your now heated oven. While the Dutch Oven heats up, turn the dough out onto a heavily floured surface and with heavily floured hands shape into a ball. 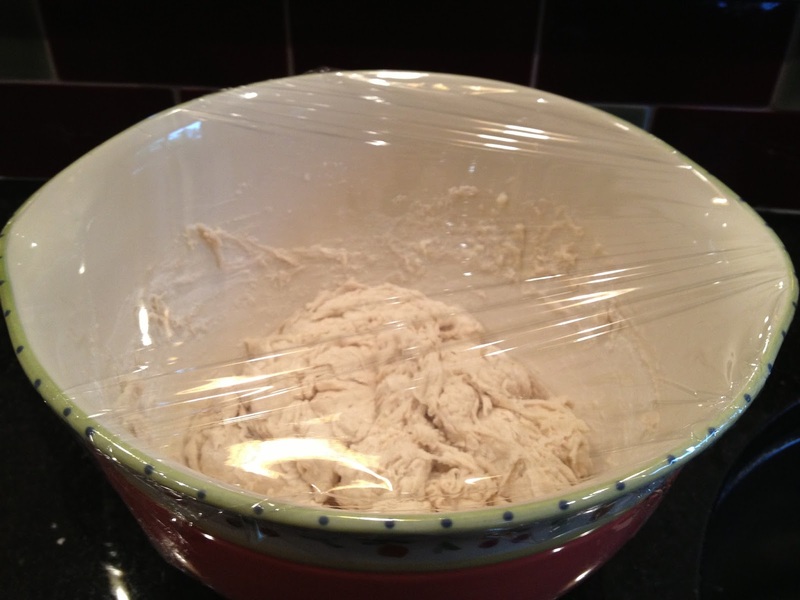 Cover the dough with plastic wrap and let set covered on the counter for 30 minutes. Remember to put the lid somewhere you won't bump into it. My cast iron lid takes a very long time to cool down. All done! Ready to cool on wire rack. Use pot holders to get the bread out so you don't burn yourself. Now stand there and admire your work! I know I always do. So after I made this awesome bread it was time to cook dinner. 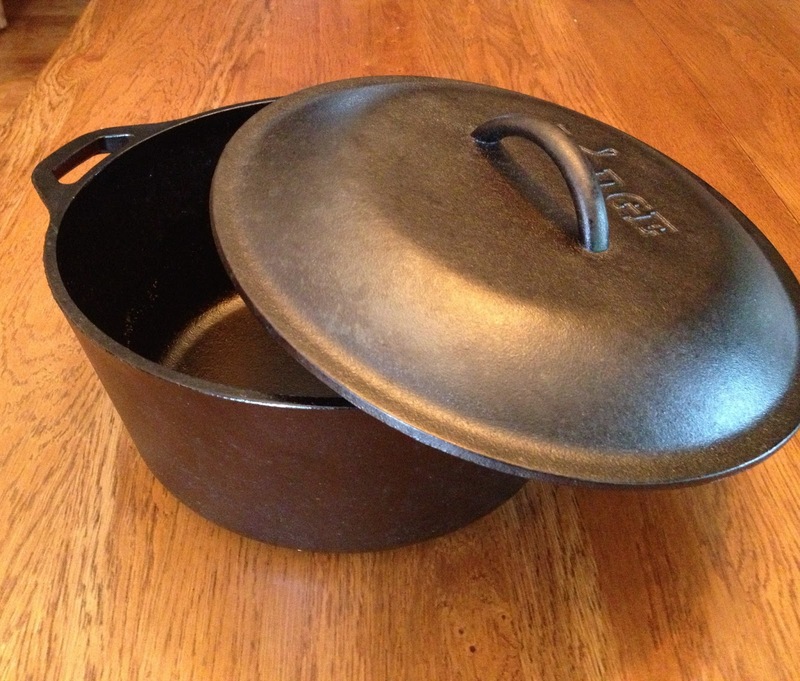 What could I do with a very hot Dutch Oven? Apparently lots of things. Scroll down to my next post to see The Dinner After. My bread never turns out. I have to try this! I just need a dutch oven-HA! I will be making this! Thanks for the recipe! The hardest part is remembering to start the day before you want to eat it. But it is so simple I still am surprised. Thanks for visiting! It looks good! 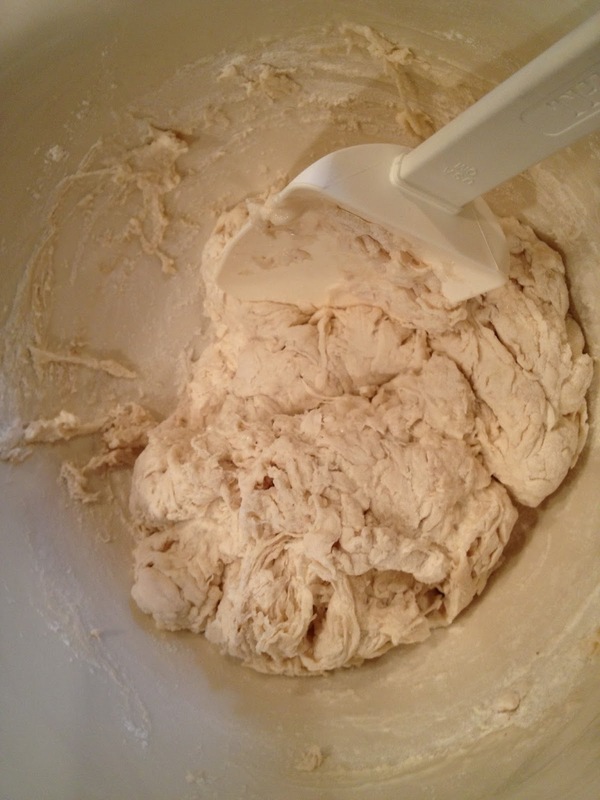 Have you ever tried making it with whole wheat flour? 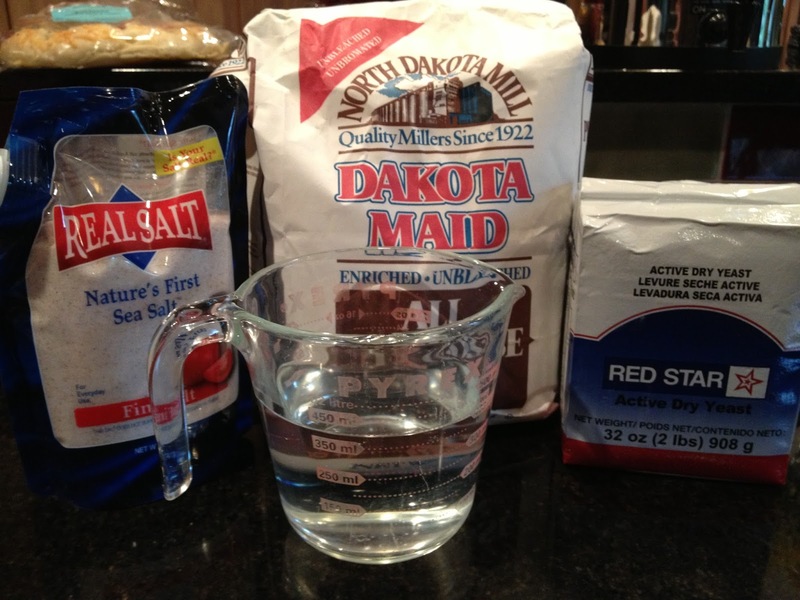 Abbi I have tried this with freshly ground whole wheat (hard spring red) with mixed results (no pun intended). Because of whole wheat flour's unique make up (as compared to all purpose flour) I think the recipe would need some adjusting just like any other whole wheat bread recipe. I have experimenting with this recipe and whole grain flour on my to-do list. I suspect that like other bread recipes it may need to have an acidic ingredient as a dough enhancer (like vinegar or ascorbic acid/vitamin C powder) and maybe even a dose of vital wheat gluten added to keep the bread from becoming a "brick". Thanks for stopping by! Looks beautiful thanks for sharing on Tuesdays With a Twist. Sounds yummy. Thanks for sharing at Wildcrafting Wednesday. Thanks! Looking forward to seeing what you have to share next time. I'm inspired. I must try this. I too have seen it several times. But you convinced me this will work. Yummmy! We're featuring BLTs or any one of these tomorrow on Saturday Dishes. I'd love it if you can by. Time for me to run and get a dutch oven! Looks like the perfect bread! Thank you Leona! This is my post that have been picked as a favorite. That makes me super excited! Hi. I am new to reading your blog. I love it. I wanted to let you know I made this bread today and we love it. I will definitely be making it again. Maybe tonight. Thanks such for sharing the recipe. Enjoy your day and God bless. Hi Donna and thanks for visiting. I am so glad you liked the recipe. It is very versatile. You can add herbs and cheese and lots of other yummy additions and I will still turn out great. Mmmmm - this sounds great. I love trying different bread recipes. Guess I need to get a dutch oven! :-) I found your blog from Imparting Grace. I'll admit that after noticing the picture of delicious looking bread your name stood out. It's nice to meet another cat person. Hi Connie, I can't say that I have tried. It might work with the added moisture. But it may brown to fast on the top so you might try aluminum foil to cover as well as the pan of water. This bread looks so good! Thanks so much for linking up, come back next monday! Have you tried it without the dutch oven? Oh will read the comments above in case someone else asked. Looks so good, I might buy a dutch oven just to cook it :) Thanks for linking to Snickerdoodle Sunday! 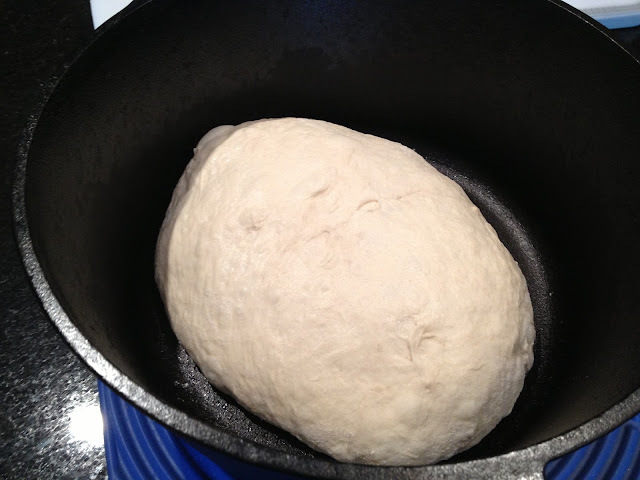 Any heavy lidded oven safe pot will work as long as it is big enough to hold the dough and handle the rise the bread gets. The heat all the way around the cooking bread makes a big difference in the way it turns out. 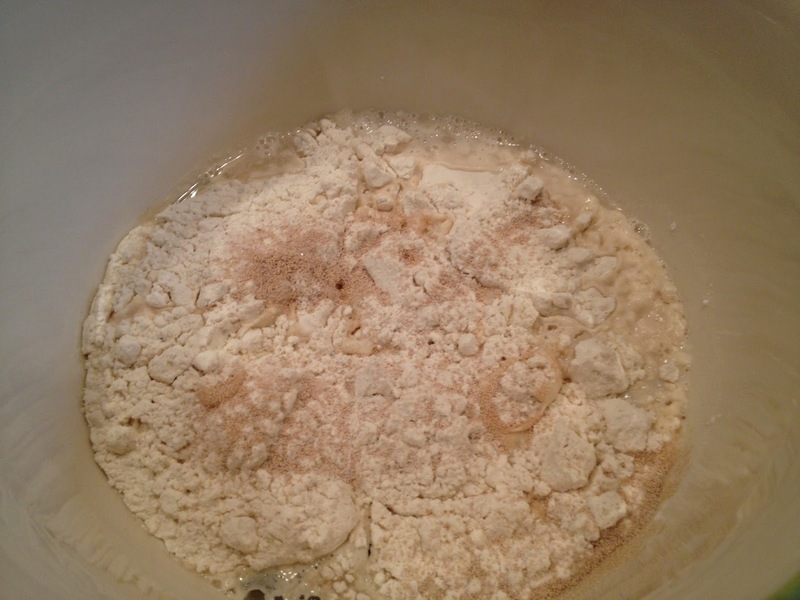 The lid also makes this very wet dough steam as it cooks a bit making a chewy french bread like texture. Without the lid the bread would be very hard with this recipe. This looks yummy! 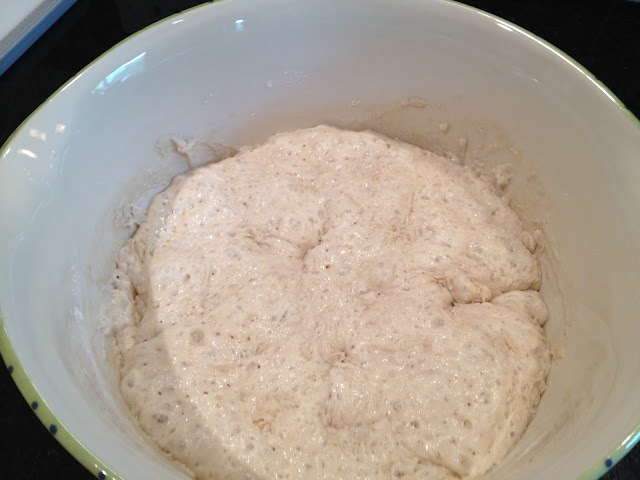 I am constantly looking for a new bread recipe and I am going to try this soon! I am one of the co-hosts of Tasty Tuesday with Anyonita Nibbles. I am featuring this tomorrow on my blog. Make sure you stop by and grab a featured button and link up again! Oh JoAnn I am so excited it worked at altitude for you! This is a very forgiving recipe. Sometimes the simplest is the best. Thanks for leaving a comment and letting me know how well this worked for you!